Mexico and throughout Central America. 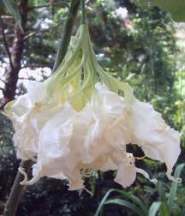 all of its parts are poisonous. (below), this selection is not a hybrid. Though this species is native to high elevations in northern South America, it adapts well to our climate. Here, it does best with shade after 2:00 PM and needs a deep watering every week during a dry summer (or as often as it wilts). 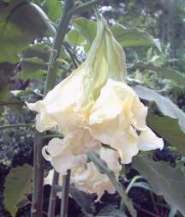 Can grow to 12' high and is a root-hardy perennial if well mulched. 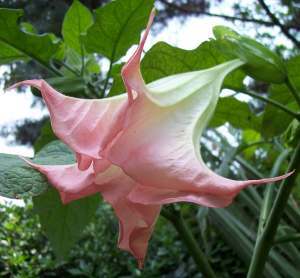 All Brugmansia selections require frequent feedings, I use several Agriform 21-gram, 2-year fertilizer tablets annually. Capsicum annuum X 'Capistrano' - 'Capistrano' Hybrid Bell Pepper - Edible Perennial, grown as an annual - Matures in 70 days, produces very large fruits which ripen red. Capsicum annuum X 'Grande' Jalapeno - 'Grande' Hybrid Jalapeno - Edible Perennial, grown as an annual - Matures in 70 days, produces very large fruits. Capsicum annuum X 'Sweet Banana' - 'Sweet Banana' Hungarian Pepper - Edible Perennial, grown as an annual - Matures in 75 days, produces large numbers of long fruits which first turn yellow, become orange and finally ripen red. Capsicum annuum 'T.A.M. Mild' Jalapeno - 'T.A.M. 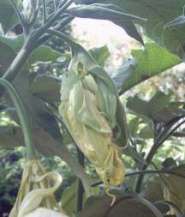 Mild' Jalapeno - Edible Perennial, grown as an annual - Matures in 80 days, produces "mildly-hot" fruits. Capsicum chinense 'Habanero' - 'Habanero' Pepper - Edible Perennial, grown as an annual - Matures in 95 days, produces high yields of extremely hot fruits. Capsicum chinense 'Red Habanero' - ' Red Habanero' Pepper - Edible Perennial, grown as an annual - Matures in 100 days, produces high yields of very, very, extremely hot fruits. Not all of these cultivars are readily available. Lycopersicon esculentum X 'Bingo' - 'Bingo' Hybrid Tomato - Edible Perennial, grown as an annual - Matures in 75 days, determinate, resistant to V, F, T, A & G, produces firm, large, globular fruits with smooth, thick walls. Lycopersicon esculentum X 'Carnival' - 'Carnival' Hybrid Tomato - Edible Perennial, grown as an annual - Matures in 70 days, semi-determinate, resistant to V, F2, N, T & A, produces high yields of fruits averaging 7 oz. Lycopersicon esculentum X 'Heat Wave' - 'Heat Wave' Hybrid Tomato - Edible Perennial, grown as an annual - Matures in 70 days, determinate, resistant to V, F2 & A, produces high yields of fruits averaging 8 oz. Lycopersicon esculentum X 'Jackpot' - 'Jackpot' Hybrid Tomato - Edible Perennial, grown as an annual - Matures in 60 - 65 days, determinate, resistant to V, F2 & N, produces tasty fruits averaging 6 oz. Lycopersicon esculentum 'Roma' - 'Roma' Tomato - Edible Perennial, grown as an annual - Matures in 75 days, determinate, resistant to V & F, produces high yields of red, plum-shaped fruits averaging 2 oz. Lycopersicon esculentum X 'Small Fry' - 'Small Fry' Hybrid Tomato - Edible Perennial, grown as an annual - Matures in 60 days, indeterminate, resistant to V, F & N, produces high yields of 1" diameter fruits. Lycopersicon esculentum X 'Sunmaster' - 'Sunmaster' Hybrid Tomato - Edible Perennial, grown as an annual - Matures in 72 days, produces fruits averaging 7 - 8 oz. Lycopersicon esculentum X 'Surefire' - 'Surefire' Hybrid Tomato - Edible Perennial, grown as an annual - Matures in 70 days, produces fruits averaging 6 - 8 oz. Lycopersicon esculentum X 'Whirlaway' - 'Whirlaway' Hybrid Tomato - Edible Perennial, grown as an annual - Matures in 70 - 80 days, determinate, resistant to V, F2, A & G, produces high yields of large, crack-resistant, very firm red fruits. Petunia axillaris - Wild Petunia - Self-Sowing Annual - A Brazilian plant with fragrant flowers (white or lavender/purple) for sunny locations. Cut it back when it stops blooming and fertilize with 15-5-10 about 3 to 4 times during the growing season. Allow a few fruits to mature to produce seed for next years crop! 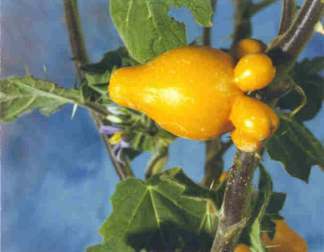 Solanum melongena var. esculentum 'Ichiban' - 'Ichiban' Eggplant - Edible Perennial, grown as an annual - Matures in 60 days, produces large crops of long, thin, purple-black fruits.